I was just looking over an assignment for Jason Fulford and Gregory Halpern’s upcoming Photographer’s Playbook (which you can pre-order from Aperture or Amazon) and thinking about social practice projects that involve assigning a group of people a task, and then pulling all those assignments together into a book. Another example of this is Will Steacy’s Photographs Not Taken, which I love. Kelly Lynn Jones’ Little Paper Planes asks a group of visual artists to reinterpret the classic paper plane. There is also a blog, a store, and a residency program affiliated with the project. A friend just gave me the Outside the Lines coloring book, which pulls together line drawings from many different artists. And the Social Practice Workbook does this too. 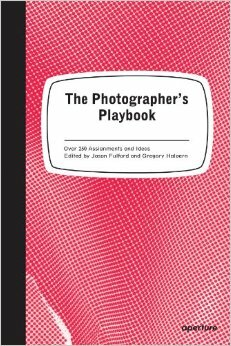 Just like the Photographer’s Playbook, it’s a collection of assignments meant to inspire work both inside and outside the classroom. Guestwork collaborators Erin Charpentier and Travis Neel have a longer description of it on their website as well. Tagged assignments, collaboration, Fulford, Halpern, many artists' work, photography, project, Steacy. Have read Steacy’s “Photographs Not Taken,” it’s a very honest, and reflective series of essays by photographers who engage in critical practice. As educators and practitioners we need to engage in more reflective exercises. Too often work is rushed through. Thanks for providing these blogs.